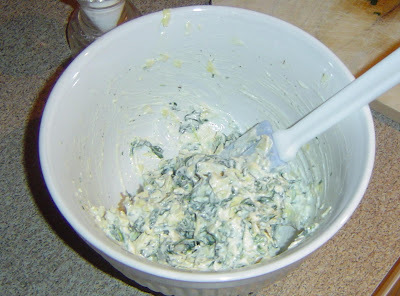 This is very close to Spinach Artichoke Dip, but is instead a spread for sandwiches, paninis, burgers, etc. And its probably a little healthier for you. 1. Squeeze any excess water from the thawed frozen spinach. 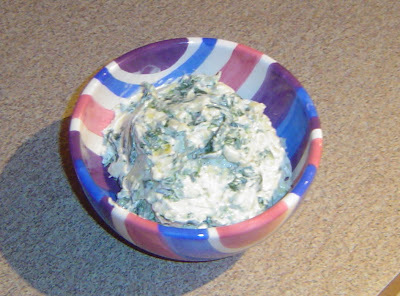 Roughly chop spinach and artichoke. 2. 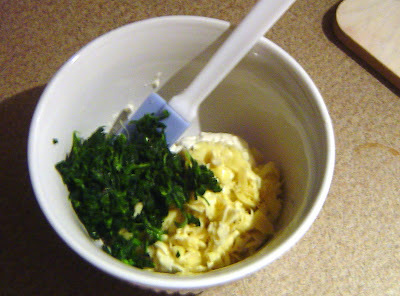 In a small bowl add spinach, artichoke, and entire tub of Boursin Light. Mix well. 3. Add salt to taste and a good amount of freshly ground black pepper. Mix again. Makes approximately one cup. Can be stored in the fridge in a sealed container for several days. Thoughts: Boursin's garlic and herbs add a lot of flavor to this spread. And in my opinion, spinach and artichokes are always a winning combination. This is would be really great as a burger topping one night.